When Howard Brookner lost his life to AIDS in 1989, the 35-year-old director had completed two feature documentaries and was in post-production on his narrative debut, Bloodhounds of Broadway starring Madonna and Matt Dillon. Twenty-five years later, his nephew, director Aaron Brookner, sets out on a quest to find the lost negative of Burroughs: The Movie, his uncle's critically-acclaimed portrait of legendary author William S. Burroughs, with sound recorded by Jim Jarmusch and cinematography by Tom DiCillo. After a lengthy search, Howard's extensive archive is found in Burroughs' bunker, opening a window onto New York City's vibrant creative culture from the 1970s and 80s, with key figures such as Andy Warhol, Frank Zappa, Allen Ginsberg, Laurie Anderson, Robert Wilson, Sara Driver, Patti Smith and many more. 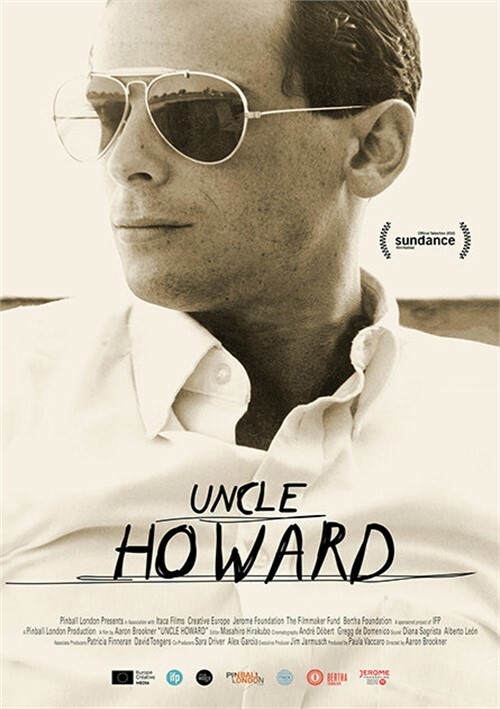 Uncle Howard is an award-winning Sundance documentary, executive produced by Jim Jarmusch, and a wide-ranging exploration of a beloved uncle's legacy. Aaron Brookner's "Uncle Howard" is a fond tribute to his hero-worshipped relative, Howard Brookner, who was involved in a great deal of professional activity of independent filmmaking before dying of AIDS in 1989 at age 34. He was fascinated by (and part of) his era's Manhattan art scenes and this documentary has a lot footage of late and still-living luminaries from William Burroughs to Madonna. The film does not spend a lot of time in Howard's early years but instead goes right into Aaron's efforts to retrieve so much material that remained untouched in Burroughs' onetime Manhattan studio "The Bunker" for over thirty years. Once he stops being stonewalled by their current caretaker, poet John Giorno, Brookner gained access to a treasure trove of outtakes and errata from Howard's first feature, "Burroughs: The Movie" (1983) - some of which he watches now with Jim Jarmusch and Tom DiCillo, who worked on that project before their own directorial careers took off. Howard was a handsome, erudite gay man who wrote his university thesis on Burroughs and won the poet's trust. He even managed to share Burroughs' heroin habit for a time but this does seem to have been ongoing. Howard had such charm that we gained access to a very reluctant Robert Wilson, the theatrical avant-gardist whom he profiled in a second documentary feature (1987's "Robert Wilson and the Civil Wars'" Howard already knew he was HIV positive by the time he began making his first narrative feature film, "Bloodhounds of Broadway", a Damon Runyun-based Roaring '20s ensemble piece featuring Matt Dillon, Madonna, Jennifer Grey, Rutger Hauer, Randy Quaid and numerous others. Because the work was so exhausting, it hastened his death from AIDS-related causes just a couple weeks before its Cannes premiere. Brookner's time with Burroughs and other like-minded artists gives us archival glimpses here of Patti Smith, Allen Ginsburg, Andy Warhol, Laurie Anderson, John Cage and many more. His personal life is less well explored, despite interviews with surviving relatives, colleagues and his long-term boyfriend, author Brad Gooch. We see parts of a video-diary made toward the end of his life, and he is calm and composed rather than revealing. A different side is seen in family photos and home movies, where it's clear why Aaron loved him so much (aside from his being a creative role model), he was clearly a wonderfully fun and affectionate uncle. His nephew appears to have inherited some of his uncle's temperament as well as physical resemblance; Aaron's narration is often touching, but it does have a slightly formal, histrionics-resistant air. The film offers both an introduction (or re-introduction?) to the director's uncle and is a somber meditation on talent lost. The documentary takes in Howard's experiences in the New York gay scene, but focuses mainly on the "Burroughs" shoot as a signifier of his uncle's emerging talent. Howard began the production as a film student fresh out of university and his ability to gain the trust of the then-near-deified poet shows a very particular skill that would have proved an invaluable directorial quality. With the early '90s boom in American independent film just on the horizon, not to mention the Queer New Wave, there are reasons to believe Howard would have quickly done very well in Hollywood. Jarmusch's presence, both as a goofy kid on the Burroughs shoot and his appearance in the documentary as an established auteur, only works to hammer that point home. What Aaron has is an archive of audio and celluloid that his uncle left behind, seemingly largely untouched over the years, in Burroughs' legendary "Bunker." This treasure trove, which largely consists of master copies of footage from the Burroughs production gives a look behind the scenes (or scene, more accurately) during the last wild days of pre-Giuliani New York, before the AIDS epidemic decimated the city's gay community. Aaron found footage of Andy Warhol dropping by for dinner, Burroughs goofing with Allen Ginsberg on a rooftop, and the writer conducting a mad piece of surgery-themed performance art. Looking back from today, Aaron points to the loss of two beacons from the era as symbols of what Manhattan has become: the Chelsea Hotel and St. Vincent's Hospital. The Chelsea still stands but is undergoing a major upgrade, leaving behind its history of "bohemian folly," while St. Vincent's, where Brookner's uncle and thousands of others were treated for AIDS-related illnesses during the crisis years, has been torn down and replaced by condos. Just as the older Brookner had to get around the reclusive Burroughs' notorious guardedness to make his film, so does his nephew have to win over John Giorno, the caretaker of the partially converted YMCA space. The dusty archive contained therein is a wealth of material and lots of footage of the Howard talking with Burroughs and other interview subjects between takes. One associate observes that that Brookner knew how to talk to Burroughs and that was what gained him access to the man. Howard Brookner rarely appears to have been without a camera in his hand, and throughout the movie, Aaron threads warm, funny moments from their family life as captured by his uncle, featuring the latter's parents and grandparents. "In more recent interviews, Elaine Brookner admits with wry self-awareness to the classic Jewish mother's disappointment when her son chose to pursue filmmaking instead of law. With a candor that excludes sentimentality, she describes coming to accept Howard's homosexuality, and reveals that being charmed by his boyfriend, the writer Brad Gooch, nudged the process along".